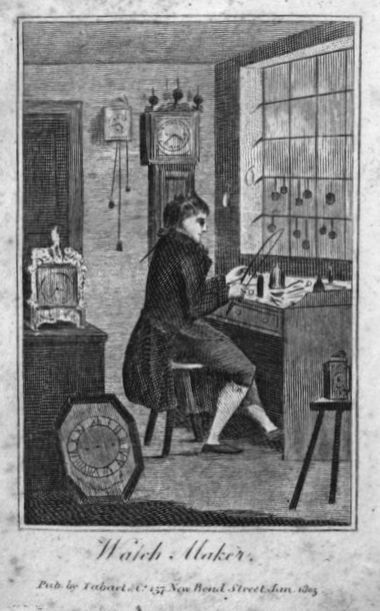 On the “second day of May in the forty third year of the Reign of our Sovereign Lord George the Third”, that is, in 1803, William Snoswell, son of Ambrose Snoswell, carpenter of Newbury, Berkshire, put himself apprentice to Thomas Udall, clockmaker of London. His apprenticeship was to be for the customary seven years, but on the back of the indenture a note by the then warden of the Clockmakers’ Company states that William only received his freedom of that Company in 1818. Either William stayed on as a journeyman after his apprenticeship and saw no need to pay for the privilege of the freedom, or he set up shop by himself outside the jurisdiction of the City and did not need the freedom to be allowed to start his own business. Whatever the reason, he only claimed his right on 12 October 1818. A week later, he married Elizabeth Hundtrodts at St. Bride’s. An insurance record with the Sun Fire Office tells us that on 3 February 1819, Snoswell insured premises at 29 Shoe Lane, giving us his first address. Fortunately for us historians, the person who entered the baptisms for St. Bride’s church also included the addresses of the parents. Not all churches did that, so we are lucky here. On 13 June 1820, son William is baptised and 6 Little New Street is given as the address. When the next child, George, is baptised on 17 February 1822, the family lives at Waterloo Street. On 28 December 1823, William Henry is baptised from 68 Fetter Lane, and on 11 March 1827, Elizabeth Ann from 64 Grays Inn Lane. These four children were all baptised at St. Bride’s, but the last child, Charles, was baptised on 4 November 1832 at St. Andrew’s, Holborn, still with the 64 Grays Inn Lane address. In 1844, son William Henry obtained his freedom from the Clockmakers Company by patrimony. Whether he remained working in his father’s shop or went elsewhere, I do not know. An amusing reference to one of the Snoswell boys, no first name mentioned, is made by Sir Edward Clarke who in his youth was introduced by his father to a Mr. Selfe, a clerk to one of the City Churches, who held a Bible class for young men at Salisbury Square in connection with the Church of England Young Men’s Society. The debating class, as Clarke called it, was at one time involved in discussing Cardinal Wiseman’s Appeal to the People of England which had been “lately published”, so Clarke is talking about 1850 or 1851. Snoswell senior died on 5 March, 1859, and probate was granted to his widow Elizabeth, still living at 1 Farringdon Street. The estate was valued at less than £300. (3) Maybe the widow continued the shop for a while, but at the end of 1861, an advertisement appeared in the newspaper to say that the whole stock and effects of the late Mr. Snoswell were to be auctioned off. And that finally gives us the first indication of what Snoswell had for sale in his shop. I have not found any advertisements for him, nor any watches or clocks that bear his name, and certainly no musical ones. All I have are a few mentions of him when things got stolen from his shop. (4) Perhaps I have been looking in the wrong places and if you can enlighten me any further, please leave a comment. 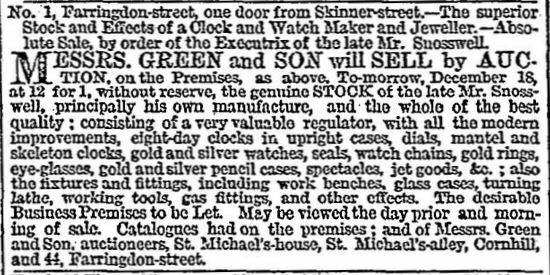 The advertisement for the sale certainly suggests he manufactured his own goods, so perhaps there are still some clocks or watches out there with his name on. The Times, 17 December 1861. (1) Lynch is given the address of 24 Farringdon Street in The London Medical Directory of 1846. (2) Sir Edward Clarke, The Story of My Life (1918), pp. 27-28. (3) England & Wales, National Probate Calendar (Index of Wills and Administrations), 1859. (4) The Morning Post, 17 October 1839, a gold watch stolen. Jackson’s Oxford Journal, 3 March 1849, attempt to steal some rings. 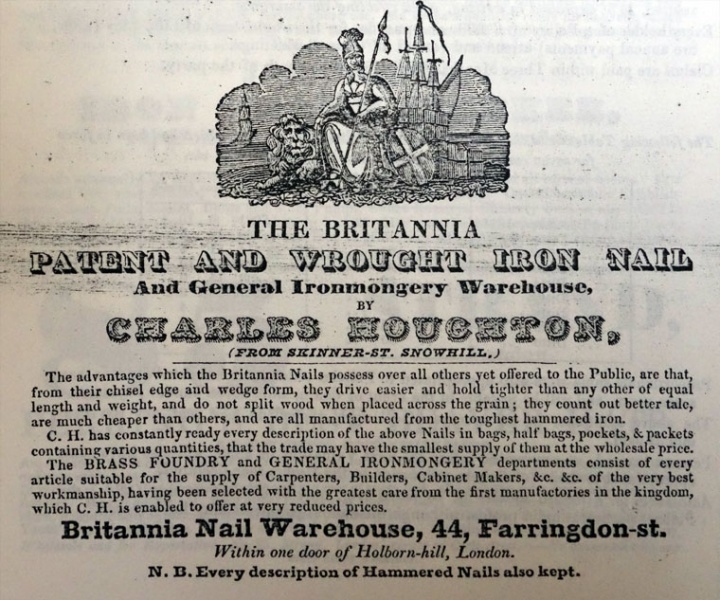 Charles Houghton ran the Britannia Nail Warehouse in Farringdon Street and according to the advertisement he had in Tallis’s Street View, you could also obtain from him, besides nails, cornice poles and ends, rings, brackets, curtain bands, and any kind of article that a builder, cabinet maker, upholsterer or box maker might require. 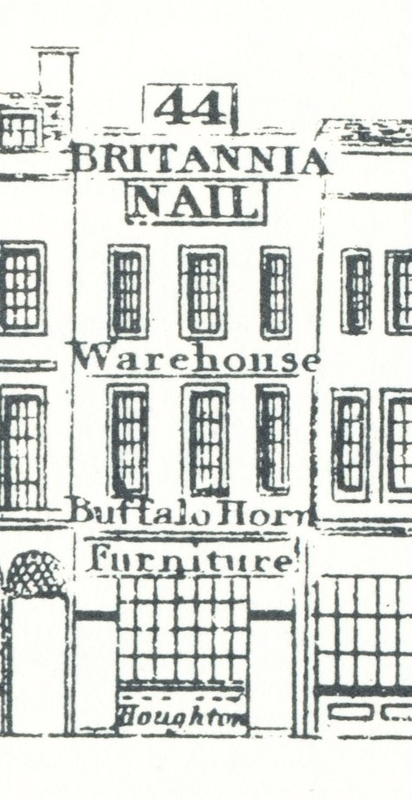 But also, as he proudly had written on the vignette in the Street View, Patent Buffalo Horn Furniture. 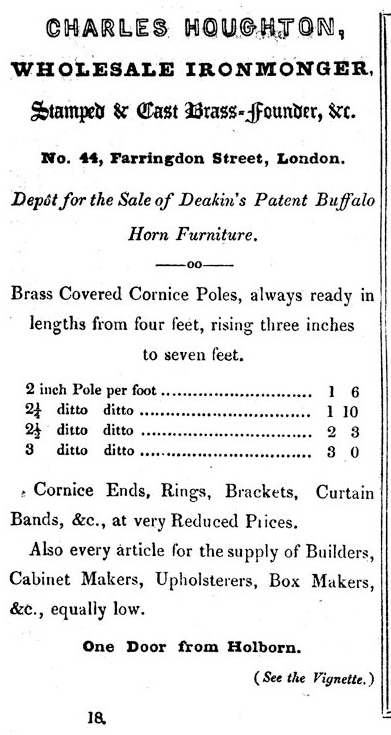 The horns were not from buffaloes specifically killed for their horns, but from the cattle slaughtered in the abattoirs, or so The Furniture Gazette of 1884 wants us to believe. Not that it mattered for the buffalo; it died anyway, and probably not in a very pleasant way. Better not think about the details. 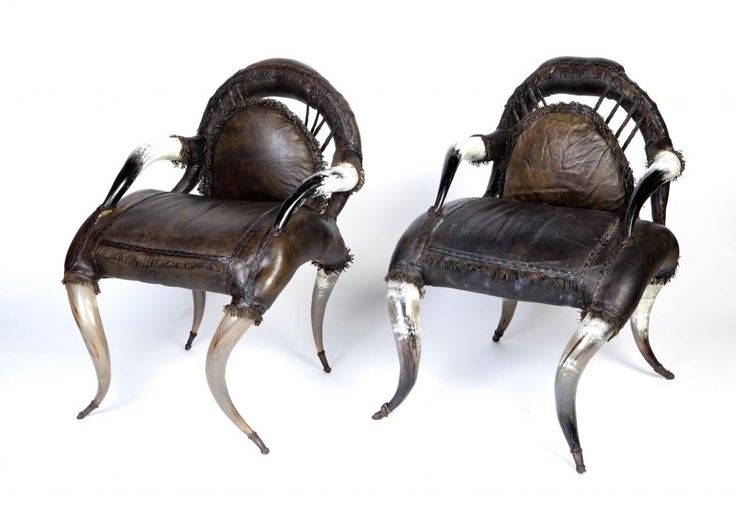 I found an example of such furniture on Pinterest – hideous I think, but there is no accounting for taste. Charles Houghton probably started his working life as an apprentice ironmonger, but whether that was in his native town or in London is unknown. On the 1851 census he is listed as coming from Bury St. Edmunds, Suffolk. 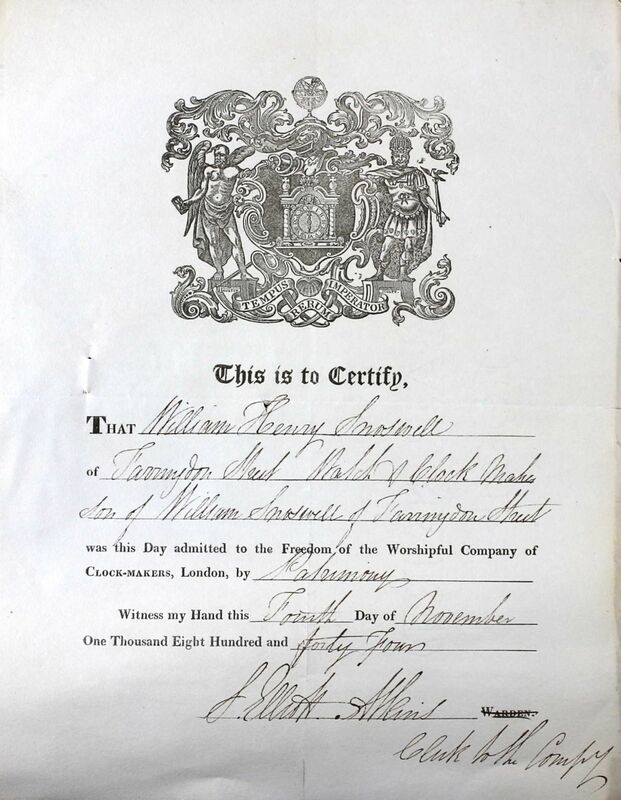 We know that he became a member of the London Bowyer Company as he is mentioned as such when he took an an apprentice of his own in March 1834, Thomas Mortin, the son of Thomas Mortin of 70, Red Lion Street, plumber and glazier. The link with the Mortin family became even closer when Charles married the daughter of Thomas senior, Mary, a few weeks later, on 19 April at St. Andrew Holborn. An 1834 advertisement (see below) mentions the 44 Farringdon Street address, but also the previous one: Skinner Street, Snowhill. 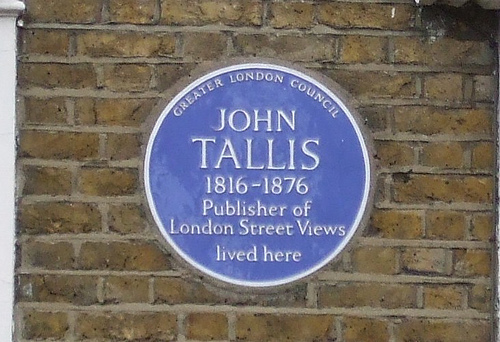 The eldest son of the couple, Charles Solly Houghton, was baptised on 28 December 1835, and many more children were to follow(1), but from 1846, the family no longer lived at Farringdon Street. Thomas Mortin was not the only apprentice Houghton had. An Old Bailey case of March 1835 relates how another apprentice, Charles Woodward, got a consignment of nails together for one Henry Smith, purporting to be in the employ of John Brees, a customer of Houghton. (2) Woodward states that he has been in the trade for three years, although he does not say that he was with Houghton these three years. Charles went bankrupt in mid-1846 and in the London Gazette notice of his problems, he is given the address of 58, Dudley Grove which is also from where his daughter Maud is baptised in late 1846. The 1851 census, sees the family living at 6, Arlington Square. Charles happens to be absent from home when the census is taken, but he can be found visiting one Mary Houghton in Bury St. Edmunds, possibly his sister. Charles is still described as ironmonger, but when in 1856, his daughter Isabel is baptised he is described as ‘gentlemen’ and living in Stoke Newington. The 1861 census sees the family living at Woodland Terrace, Islington and Charles is then ‘Collector to a brewery’. Charles dies on 25 August 1866 at 84, Newington Green Road and probate is granted to widow Mary the following May. (3) The estate is valued as under £1,000. The following census of 1871 sees daughter Laura as the head of the household at Grange Road Terrace, Stoke Newington. She is described as a school mistress and with her are living her mother and four of her sisters: Gertrude, Fanny and Maude are described as governesses and Isabel as a scholar. And that is as far as I will take this story of the ironmonger’s family. (1) Laura Mortin (bapt. 13 Oct. 1837), John Rowland (bapt. 29 April 1840), Gertrude (bapt. 5 May 1842), Fanny (bapt. 14-01-1845), Maud (bapt. 30-12-1846), George (±1849), Mary Ann (bapt. 4 Jan. 1852), Arthur (±1854), and Isabel (bapt. 30-11-1856). (2) Old Bailey case t18350302-842. Smith was found not guilty on the grounds of insanity. (3) England & Wales, National Probate Calendar (Index of Wills and Administrations), 1867. 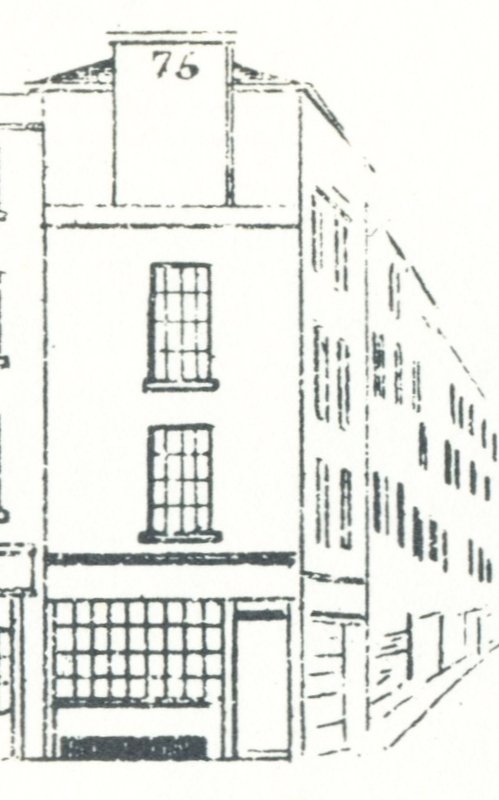 The premises of Thomas Nettleton were situated on the corner of Farringdon Street and Stonecutter Street. Farringdon Street was more or less the successor to Fleet Market, opened in 1737 on a newly culverted stretch of Fleet River. The market consisted of two rows of open shops with a passage between the rows, but by 1829, it was so run down and in the way of the increased traffic, that it was cleared and Farringdon Street constructed. A new market, Farringdon Market, was set up just behind Farringdon Street with an entrance for carts in Stonecutter Street and one for pedestrians in Farringdon Street (between numbers 66 and 67), but it was never very successful. Fleet Market from W. Thornbury, Old and New London, vol. 2, p. 498. The Nettleton family had been on that particular corner when the road was still called Fleet Market, as in his will of 1825, father William’s address was given as 75 Fleet Market. (1) To be clear, the shop at number 75 was not a stall at the market, but a ‘proper’ building in the street behind the market stalls. In 1832, the record of the Sun Fire Office shows an entry for “Messrs Nettleton and Co., 75 Farringdon Street, tinmen and braziers”. Who exactly was in the business besides Thomas is unclear, perhaps a brother, but the 1841 census just shows Thomas and his family on the premises. 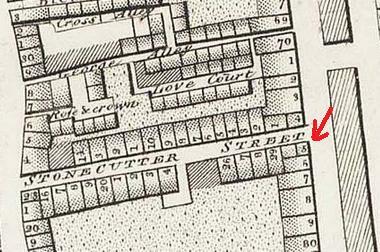 In 1814, at the baptism of Thomas, he and his parents William and Hannah lived at 9, Tash Court. (2) Tax records for Farringdon Without in 1819 place William Nettleton at the west side of Fleet Market. Two years later, in August 1821, William obtains the freedom of the Tinplate Workers Company by redemption, paying 46s 8p for the privilege. In early 1822 he is admitted to the freedom of the City, but does not enjoy it for very long as he is buried on 17 April 1825 at St. Bride’s. Curiously, his address is then given as Stonecutter Street. His son Thomas is not admitted into a City Company until 1841 when he receives his freedom from the Worshipful Company of Founders “by servitude”. If we look more closely at the census records, we find Thomas and his wife Mary at number 75 as well as a 6-year old girl Jane Jones. Unfortunately, the 1841 census does not yet provide family relation details, so it is unclear who the little girl was. Thomas and Mary (Ann) Fox were married on 27 April, 1834 at All Hallows, Lombard Street. Ten years later, at the next census, Thomas appears to have moved to 30 Stonecutter Street, but looking at Horwood’s map of 1799, I think it is just the other address for what was essentially the corner building. In 1851, Thomas is employing two men, one apprentice and one boy. Thomas is living with his wife Mary Ann, Hannah Self, his mother-in-law, and James Tyrell, the apprentice; there do not seem to be any children. In the 1833 tax records for Farringdon Without, one John Self, leather seller is found below the entry for Nettleton. And in 1829 John Self, a widower, marries Hannah Nettleton, a widow at All Hallows. I assume that Hannah Self was previously married to a Mr. Fox, hence the last name of Mary Ann, but have found no record of such a marriage. Also living at 30 Stonecutter Street are William Langton, fruit salesman, his wife Mary and daughter Mary Ann. Presumably they rent part of the building. (3) In 1861, Thomas and Mary Ann, one apprentice, John Coucher, and one servant, Emma Fox (is she a relation of Mary Ann?) are resident above the shop. Mary Ann dies in January 1864 and is buried at St. James, in Swain’s Lane, or Highgate Cemetery as we would now say. Thomas remarries and in 1871 he is found at 30 Stonecutter Street with his second wife Emma (was she previously the servant Emma Fox? ), and employing three men and one boy. They are still there in 1881, but what happened to them after that is unclear, they may have moved away or died, but I have not been able to find any records to either possibility. (1) PROB 11/1702/455; dated 26 August 1825. (3) At the LMA are held Deeds and other items relating to 29 and 30 Stonecutter Street (ref. : P69/BRI/D/047/MS14843), but they concern the leasehold and do not mention the Nettletons.